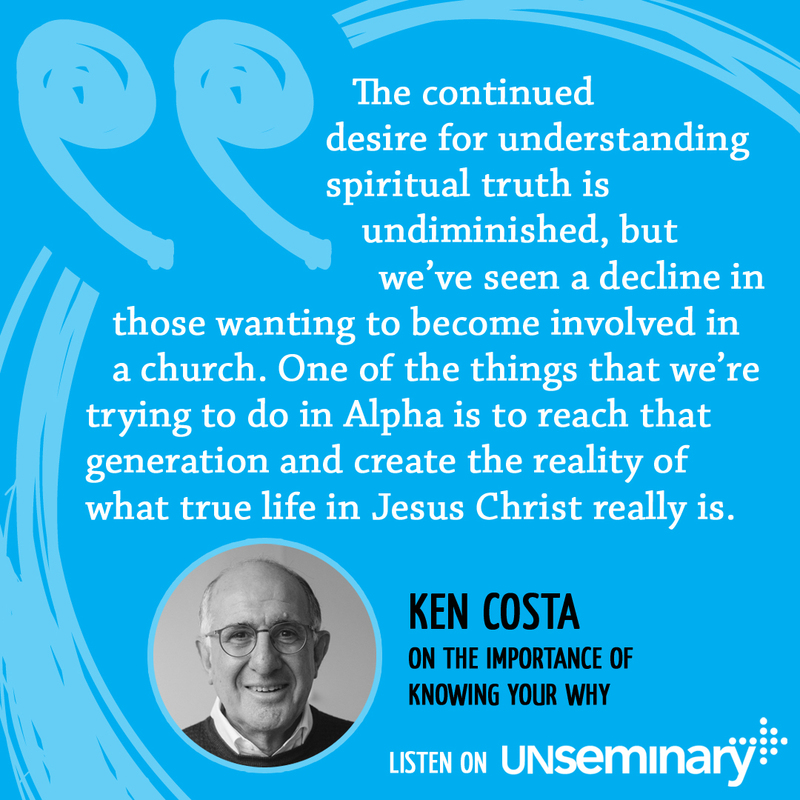 Thanks so much for joining us today with this week’s unSeminary podcast. This month we’ve been talking with church leaders around the globe about what God is doing in their part of the world and what we can learn in our own ministries. Today we’re speaking with Ken Costa, the founder and author of God at Work as well as the chairman of Alpha International. He’s from the United Kingdom, though he grew up in South Africa. It wasn’t until he moved to England that he found faith and began to realize that there is a God who cares about justice. From that point, Ken decided that he wanted to make a difference in the world and in other people’s lives so he began to read about law and theology while at Cambridge University. He began preaching and working to train and lead the younger generation to make sense of the workplace and the purpose for their lives there. 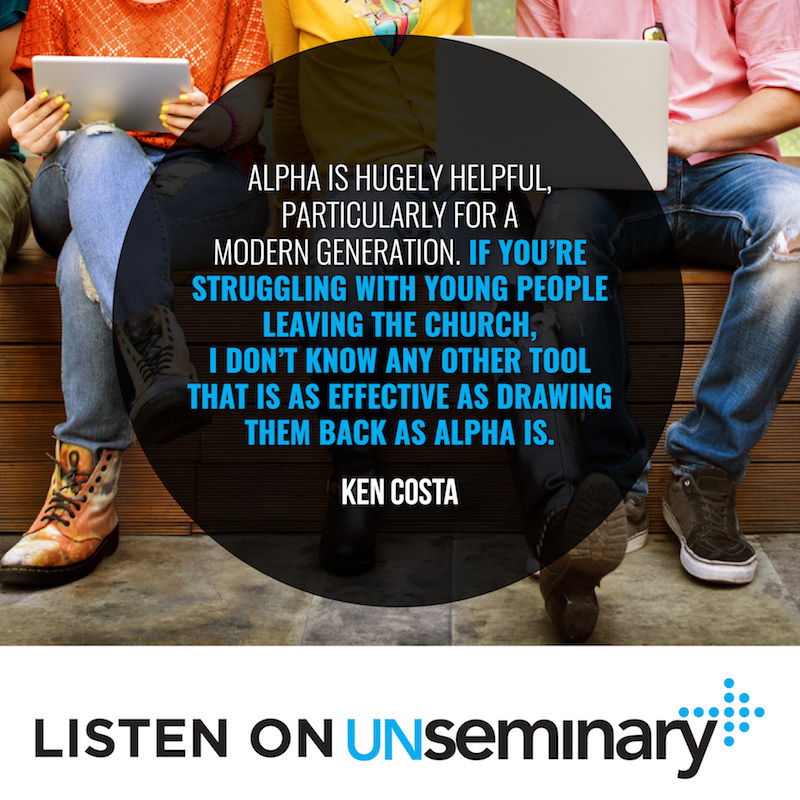 Ken also works with Alpha to teach people what true life in Jesus Christ really looks like. Ken is with us today to talk about the effects of ministry within the young working people and how the population of Christianity is changing. Help the younger generation understand spiritual truth. // Ken points out that over the years, the number of people in the UK that classify themselves as having no religion has grown and is now outnumbering the people who identify as Christian. It’s a growing concern especially among the younger generation. Men and women in their 20s and 30s no longer see the church as relevant and so we need to come up with new ways to communicate the timeless truth of the gospel. Change the view of the church. // In spite of a lack of interest in the church due to negative perceptions, there is still a hunger for spiritual understanding and truth. Young people now pour themselves into social justice, political causes and ethical investments, craving a meaning in their life and spiritual identity, but unsure where to find it. Here is where Alpha comes in. One of the missions of Alpha is to teach what the church is meant to be, what life in Jesus Christ looks like and why it matters to them. Questions without answers. // Through the new Alpha Film Series, people can learn about the Christian faith in a very relaxed and conversational environment. With a documentary feel to it, these videos are perfect for generating discussion among a group who is watching. Ken notes that the Millennial generation wants to feel like they are a part of something so community is very important. One of the events Alpha hosts is a dinner where people come to watch their film series and then the room is open for discussion. The event is non-denominational and people are allowed to speak and ask questions that may not have answers. They can speak freely and openly about the questions they have that may stop them from becoming involved in a church or identifying with the Christian faith. This is a big step toward leading these younger people back toward Christ: allowing them to ask the questions they struggle with and voicing their opinions openly. You can connect with Ken and also find information about his book Know Your Why: Finding and Fulfilling Your Calling in Life at godatwork.org.uk. All month we’re celebrating 3 years of the unSeminary podcast and anticipating the launch of my new book … UNREASONABLE CHURCHES | 10 Churches Who Zagged When Others Zigged and Saw Impact Because of it. Click here to sign up on our special microsite to get front the line access to more information about the launch. Rich – Well hey everybody, welcome to the podcast, my name’s Rich, the host around these parts. So glad that you’ve decided to tune in today. This month we’ve been taking time out to talk with church leaders from around the world about what God’s doing in their part of the world and getting a thin slice on that and what we can learn. Today I think you’re in for a real treat, we’ve got Ken Costa with us. He’s the Chairman of Alpha International, was an international banker, has done a lot in his life and I’m just really excited to have, it’s always nice to have somebody from across the pond, so Ken welcome to the show. Ken – Very good to be able to talk to you and to talk to all of the people that are listening to your podcast, even if I have a slightly odd Downton Abbey accent. Rich – It’s so funny, I have this running joke that I like to do when I meet folks from the UK, I’ll say, “You know, your accent, what part of Texas are you from?” You would be amazed over the years the reactions I get to that, a little bit of a shock. Anyway, why don’t you tell us a bit about yourself Ken. Rich – Give us a sense of your story. Ken – Yeah I’d love to, thank you so much. So I grew up in South Africa, grew up in the horrible years when the Apartheid system was really still going there, everything within me as a young student rebelled against the sort of injustice of it all. Left South Africa, with not really any degree of faith, came over to England, came to Cambridge University. Faith came alive, I began to see there is a real sense of a God who cares for justice, which makes a difference to one’s life and I thought I want to make a difference. So I read law and theology at Cambridge University, I read theology because I just wanted to be able to see whether the enthusiasm with which one sort of took on the faith actually had any kind of rational basis and I realized then that, you know, if theology isn’t something to do with a practical life of an ordinary person, it’s of no use at all. So I then went into, what we call the City of London, which is the finance juristic of London and had been there for 40 years, still there, became Chairman of two major financial institutions and at the same time was very active in Holy Trinity Church, which is the largest Anglican Church in the UK, preaching there, writing and also just taken on being Dean of the Leadership College, London, which is there to try to help young Christians, particularly in their 20s and 30s, to make sense of the workplace, so that they are not constantly only at the mercy of what they might hear on a Sunday, wonderful as that may be. You need some extra tools, particularly in the stressful workplace that there is at the moment. So I’ve got a little mantra that says, “My workstation is my worship station,” and when we learn that these things run together, that’s great. I have a lovely wife who has just completed a PhD in the study of the effects of music on older people, fortunately I’m not a candidate yet, and four children and we live in London. Rich – Nice, very good. Well I really appreciate that. One of the things I try to encourage people over the years, I was in the marketplace for a little bit before I jumped into vocational ministry and I’ve always tried to encourage people over the years, if you read scripture it seems like God is more at work in reaching people in the marketplace than he is in holy places. If you look throughout scripture, God calls people when they’re in their day jobs, whether they’re out working in a field and there’s a burning bush or whether they’re fishermen and Jesus is calling them or even if they’re tax collectors, it seems like God pursues people in the marketplace, and I think sometimes we can forget that. Ken – Absolutely right and the fact of the matter is, if we wanted to see a revival, which we all long for, of faith in Jesus Christ growing, it will be because ordinary men and women, in their workplaces, become the evangelists for the missions. Ken – It’s can’t be done by the Pastors, as much as we love the Pastors. Ken – And they themselves agree and I always tease my Pastor friends with one little things which is, “If Jesus turned up, you would have expected him, at least, to have one, if not two Rabbis, religious leaders amongst the 12, he didn’t. Rich – That’s a good point. Ken – Every single one of them came from the workplace. Ken – Maybe there’s some hidden message. Rich – Absolutely. Well we’ve been taking time out to kind of hear about the spiritual climate of various countries, I wonder if you can kind of give us the sense, help us understand the spiritual climate of England, of the UK? Ken – Well that is unfortunately depressing and I wouldn’t want to depress you. In the last month, for the first time ever, I mean for over a thousand years, those who regard themselves as having… into the census as saying their religious affiliation is none, the ‘nones’ as we call it, exceed those who would have identified themselves as Christian. That’s profoundly serious and it is a trend that we’ve noticed over the years and it’s one that personally I think we need to address very seriously, particularly to a young generation and trying to make sense of what the gospel is to a modern generation. Rich – You’ve obviously seen that trend happen over a number of years, we see that happening on this side of the pond as well. What have been some of the signposts that you’ve kind of seen, the evidence of that and obviously there’s ultimately the statistical reality of it, but what are some of the ways that’s working its way out in your culture? Ken – Well the weird thing is the continued desire for understanding spirituality and spiritual truth, that is undiminished. We’ve seen greater investment by people into ethical investments, we’ve seen an increase of those wanting to join political causes with a small ‘p’, maybe related to the environment or to justice as it may be, but we’ve seen a decline in those wanting to become involved in a church, because the whole understanding of the church has got a negative view, sadly. One of the things that we’re trying to do in Alpha, through the new Alpha Film Series, is to reach to that generation and to create the sort of reality of what true life in Jesus Christ really is. Rich – Absolutely, and this is probably a great way to kind of pivot, what is it that Alpha is… First of all, for folks that don’t know Alpha, which is always a surprise when I bump into leaders that haven’t heard of Alpha, why don’t you give us a description of Alpha and then maybe, can you give us a sense of how God is using Alpha in the UK to see people take steps closer to him? Ken – Sure. So Alpha is basically a 10 weeks course of introduction to the Christian faith, which was developed by a great friend of mine called Nicky Gumbel and it has a simple format. It is recognized, particularly in the postmodern and millennial generation, people like to come together, they like to have a sense of belonging. So they come together and we have a meal together, which is a crucial part of it, then a very short introduction to one of the key things of the bible, you know, why Jesus, why pray, what about the church and then a discussion group in which we enable people to talk without being given answers, which is a key part of this. So there’s no pressure and not only is there no pressure, it’s very postmodern in the view that we like to hear what your views are, the reason being that Alpha takes people on a journey and as they learn in this journey, so they get to a stage where they see faith, are filled with the spirit of God and want to live their lives in a very different way. And we have seen just the most remarkable evidence of it, whether it’s in hardened, hardened criminals in our prison system, coming to faith and bringing the people with them, whether it’s the rich or the poor or the educated, the uneducated. In this country and other countries, 29 million people have been through the course and it is a work of God, I mean, people say, “Oh well you’re very good at marketing etc.,” well I know many Christian organizations that are very good at marketing, that isn’t the test, some of them fail, some of them don’t. But this, I do think, has tapped into a way of sharing the good news of Jesus in a very sort of relaxed way, with people who are seeking to go on a journey and finding Jesus on the journey. One of its greatest strengths, I think, is it’s totally non-denominational. We have many people that are Catholics and Baptists and Anglicans and Pentecostals, all coming together without any sort of distinctions or feelings of unease, and that’s just typical of a generation. Rich – Right. Yeah, if you haven’t seen, particularly for the people that are listening in, if you haven’t seen the new Alpha film series, that’s pretty recent right? Ken – It’s just out, just out. It’s brilliant because it’s shopped all over the world. Rich – It is amazing, it’s so well done and the thing I want to encourage leaders who are listening in, so don’t miss this. So Alpha is literally born out of a culture where a lot of the communities we’re in are heading towards a post-Christian, a post-religious culture really, still spiritual but really in a post-Christian, post-religious environment and it’s asking… I think it’s very well done, it’s high quality and it’s doing it in a way that we have to learn how to communicate with the assumptions that are really a bygone era of like this kind of assumed, kind of Christian understanding, we have to get over communicating like that, we’ve got to communicate in a way that people who don’t have any understand of scripture, of very little understanding of scripture, can ultimately see Jesus more clearly and that’s what I love about Alpha and particularly the new film series. I think it’s so well done, it’s so high quality. Ken – You’re very kind and it’s hugely helpful, particularly for a modern generation. If you’re struggling with people, young people, leaving the church, I don’t know any other tool… and it’s a tool, there’s not many out there, that is as effective as drawing them back in as Alpha is. Rich – Now the switch to, I don’t know if it’s a switch, but the kind of change on the most recent kind of film series, what were some of the thinking behind that, because it does seem, it’s been a while frankly since I looked in on Alpha’s resources and this most recent version of it just seems, it’s different, it has a different kind of feel to it, what drove that? Ken – Well what drove that is that we’ve got… in order to stay ahead of the curve, we have a continuing innovation process of innovating and changing and we’ve realized that, particularly for a younger generation, actually having a talking head for 35 minutes, explaining some aspect of the gospel is great if you’re already there, but it doesn’t really entice those who are not. So we reformatted this whole thing by showing, firstly the global nature and the cultural diversity of the people who’ve been on Alpha, so we had to travel around the world and it’s written in docu-style, it’s a conversational style. It still works from Nicky Gumbel and his words in there, but much more what people would be used to watching if they were watching a documentary. So it again produces a very relaxed atmosphere but the truths are all the same and the truths are the ones that this vehicle is enabling people to get at in a very modern way. Rich – Absolutely. Now changing gears a little bit, I want to hear a little bit about your most recent book. So you’ve wrote this book, it’s called, Know Your Why: Finding and Fulfilling Your Calling in Life. Why did you write this book? What was kind of motivating you to say, “Hey, I want to sit down…” It’s a lot of work to pull together 60 thousand words to make it work. What was it that drove you to write this book? 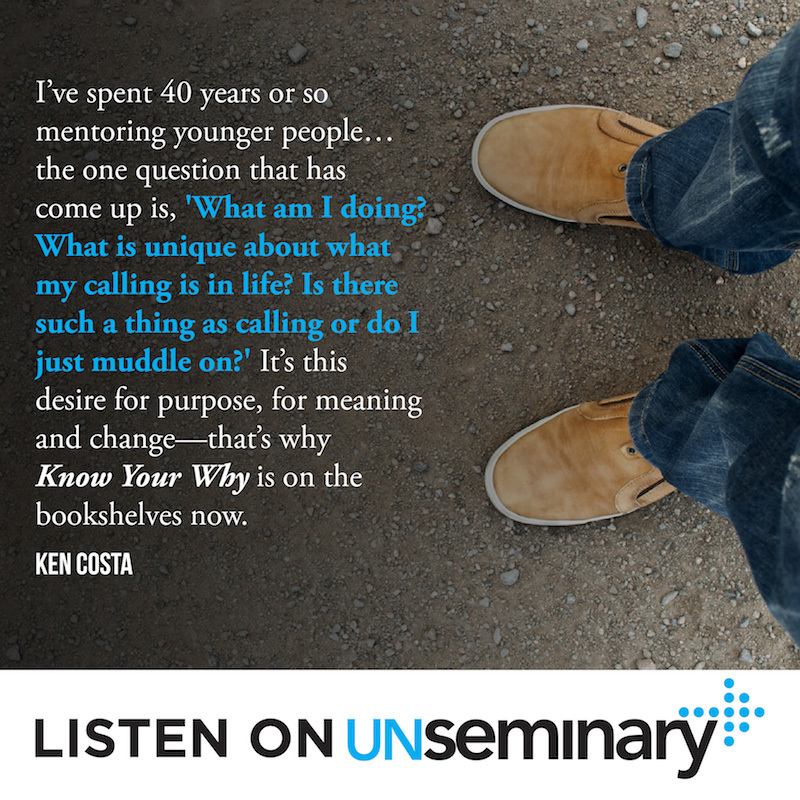 Ken – Well, I think of all the questions and I’ve spent 40 years or so mentoring younger people, mentoring people in the church, the one question more than any other question and particularly intensively in the last seven years or so that has come up is, “What am I doing? What is unique about what my calling is in life? Is there such a thing as calling or do I just muddle on?” and the reason for that is that, whereas I would have one, maybe two jobs in my life when I first started working, no self-respecting millennial would think of anything other than sort of half a dozen to a dozen. Ken – So that means one has to really understand what it is that you’re made of, why God has called you to a season and to enjoy that season and at the same time to be prepared at the right time to move into another season of life. So it’s this desire for purpose, for meaning and change, meaning within a changing and very rapidly changing workplace, that has created a lot of stress and anxiety, that when you grasp this, that you’re loved, you’re known and you’re called, is the basis on which judgements are made, that there’s an incredible sort of flow and freedom and flourishing of life, which previously had been really rather depressing. So that’s why Know Your Why is on the bookshelves now, which I’m very grateful for. Ken – You start preparing for Christmas quite early. Ken – One of the things also to say is that, yes it is true that it’s an individual to know my why is an important bit, but we need to realize that worldwide our country’s no different and I dare say the same as yours, there is an identity crisis about what it is that we are, as a society, trying to achieve. Ken – Therefore it is true of a citizen as it is of a community, of a church, of a city and of a country, Know Your Why, it was a desire and identify is an essential brick in what I believe God is building for us to help our countrymen understand that you can know your why, there is a God who is able to help us on our journey. Rich – Very cool. Well kind of as we wrap up, I would love to hear from you, if you have either a global perspective, obviously through Alpha, you have an opportunity to interact with leaders all over the world, what would you say to some church leaders in North America, as we’re trying to serve our culture, as we’re trying to reach the people that God has put in our communities, what advice or what council would you give to us as we try to wrestle with those issues in our part of the world? Ken – Well I wouldn’t presume to be able to give you very much, but in observance, just from where we are, two things. The first is that your young adults, your young people in their 20s coming into the workplace are drifting away at a rate that is perfectly alarming, if the last Alpha statistics are true, we’ve experienced this but probably maybe 10 or 15 years before you. Previously Alpha didn’t take off in the US, it is now, because it was seen to be… we’re all Christian, so why do you want an evangelistic course to see people come to Christ? And it’s taking off now because many of the churches are realizing that this is what is happening, people are drifting from the faith, with no faith and the ‘nones’ are growing; the generation that is not educated in the church or the bible. So that’s very important to just recognize some of the experience we’ve had in the secularization process. The second is, it’s profoundly serious for the world if America loses its confidence in the gospel, that is really, really challenging. Rich – Well Ken, I appreciate that, I appreciate that word, I appreciate you being on today and just the work that you do. I just want to say thank you for the support that you’ve given to Alpha over the years, the difference it’s made in so many people’s lives, the way it’s helped so many churches and I appreciate that you’re continuing as an organization, continuing to push to the future and say, “Hey, you know, it worked great 15 or 20 years ago, but we’ve got to reinvent this, we’ve got to think about the future, we’ve got to reach new folks,” and I appreciate that. If people want to get in touch with you, learn more about your book or in touch with Alpha, how can they do that, what’s the best way for them to do those things? Ken – Well there’s two ways, there’s clearly buy the book, Amazon or Barnes & Noble or at book stores that they’re close to, which would be the first place. The second would be godatwork.org.uk or the Know Your Why Facebook and website that they can access. For those who are searching for their why, find your why, know your why and when you’ve found it, help others to find theirs.